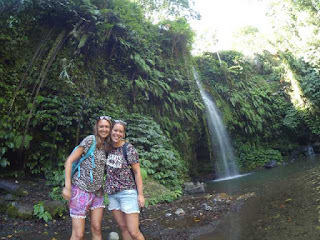 Trip Advisor Indonesia - Benang Kelambu Waterfall is one of the sexiest tropical escape destinations in Lombok island. It is located about 40 kilometers away from center Mataram (The Capital of West Nusa Tenggara, Indonesia) or in Aik Berik Village, Batukliang Utara Sub-district, 22 km north of Praya. 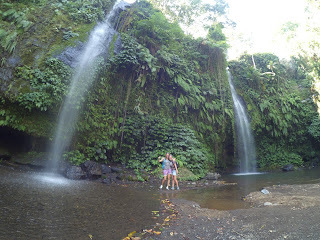 The Benang Kelambu waterfall provides 5 groups of nature waterfall including three unnamed waterfalls, and twin watterfall Benang Stokel and Kelambu itself. The Benang Stokel waterfall means "A Ball of thread", depicting the finesse of the falls size. And the water flows onto a small stream, so the clean with beautiful pebbles fresh water can be enjoyed right through. The variety of moss vegetation, crawlers and small trees are decorating at the rocky sides, making it looks green, fresh and beauty. The water's ice cold fresh is blending with the hot tropical environment, make it perfect escape place for tropical destinations. While it can stimulate your soul and spirit into healthy atmosphere. Thus, the waterfall is about 20 meter high trough the steep rock face and provides quantity of fresh iced water. The Benang Kelambu is located about 1 kilometer away from Stokel point. It can be reached by 30 minutes trekking or ridding a car. The waterfall is about 35 meters high and perform much greater than the Stokel waterfall. It is hanging on the air so it seem like a decorative framework to conceal curtain fixtures at the top of a window casing. The best accommodation is using rent car or motor bike. It is recommended to use local guide. If you would like to do yourself, please take care the sign of the waterfall route or see from the following map. From Mataram you can go to the route of Mataram - Narmada - Sedau - Pancor Dau - Teratak - Aik Village. The waterfall is located at the Aik Village. Note: Entrance Ticket: 5000 - 10.000 IDR/person. No public transport to reach this locations.